We’re a free spirited bunch at Wylde Sky. We like adventure and are always up for something new – hell, that’s how Wylde Sky was born. So we aim to bring you something new to taste, something different that you may not have experienced before. Our focus is on brewing true classics and uniquely crafted beers. Brewed and numbered in small batches. We invite you to join the journey of our beers through different numbered versions of the styles we’re brewing. Our beers evoke the freedom and excitement that comes from embracing the journey and not being constrained by the same old. We never compromise on quality and taste. Our beers are unfiltered, unfined and unpasteurised – for a fuller flavour. We have a thirst for good beer. Our aim is to produce quality craft beers - whether true classics or uniquely crafted brews. Pretty simple really. When it comes to brewing we are pretty damn zealous. Quality ingredients. Respecting our craft. No shortcuts. We love styles from all corners of the world and exploring different hop varieties, malt mixes, water profiles and techniques. We also know that a lot of people like us also want to drink something that’s delicious, balanced and a little more “every-day drinkable”. You know - the kind of beer that you’ll stock the fridge with. Whether easy drinking or more complex, we’re sure that you’ll enjoy discovering our range. Oooooo! This is going to be fun. Click in to find out the details and bid to raise money for Meningitis Now. Open Mic hosted by Jazz on Tap. All welcome. Wonderful jazz vocalist Kate Williams is accompanied by the sublime guitar of Linton’s own Louis Thorne. Kerief’s Jamaican South African fusion flavour pairing well with cold beer and cool jazz. Seriously good wood fired pizzas. 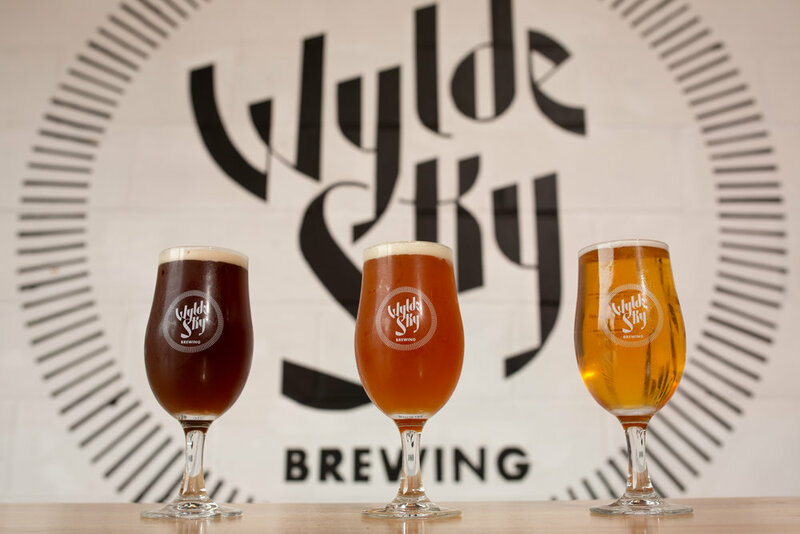 A whole bunch of stuff happened to bring Paul, Paulo and Chris together to make Wylde Sky Brewing a reality. A vision based firmly on a shared love of good beer. With our assembled backgrounds in craft brewing, business and hospitality, we built our 10 bbl Brewhouse from the ground up and started brewing in September 2018. We are based in Linton, a small village outside of Cambridge, UK on the Cambridgeshire-Essex-Suffolk border. We are proudly pouring in our brewery Taproom and would love to see you for a beer.